One of the first types of head protection to be introduced in the US was the (HPS) Head Protection System in the 1998 BMW, it is also known as the (ITS) Inflatable Tubular Structure. Today these are also being used in many large trucks and fire apparatus. These are much different than the curtain airbags we see in most vehicles. This tube is anchored at the front to the bottom of the A post and at the rear to the roof rail behind the B-post, allowing it to deploy diagonally across the window opening. The bag is stored inside the trim of the A-posts and behind the headliner trim over each door. When undeployed, the only identifying markings are the letters 'HPS' embedded in the trim cover at the top of the A posts. The gas inflator is located at the front end of the system. 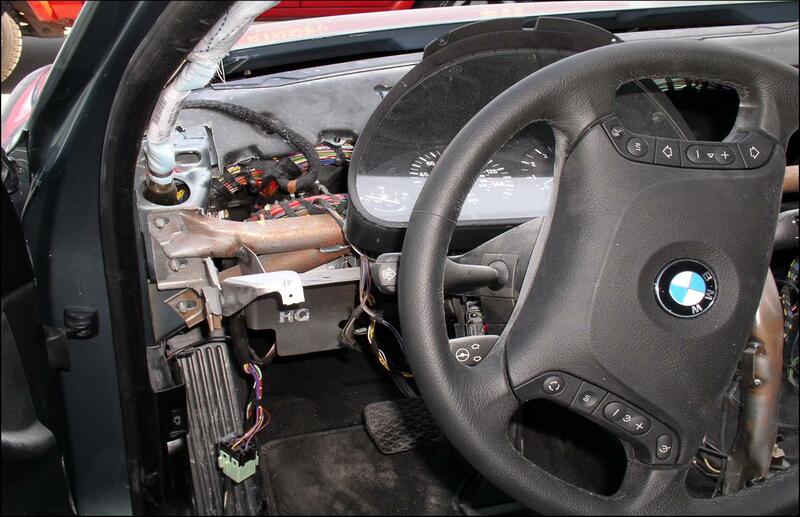 The canister which is felled with nitrogen gas is mounted in the dash at the lower A-pillar area. These systems will deploy if the sensor experiences an impact of about 12 mph or above. Unlike other airbags; the tubular airbag consists of a specially designed material woven in a pattern that expands as the bag deploys to form an air tight tube. The bag is 38 inches long and five inches in diameter when inflated. Nylon web straps are sewn to each end of the bag to attach it to the vehicle. 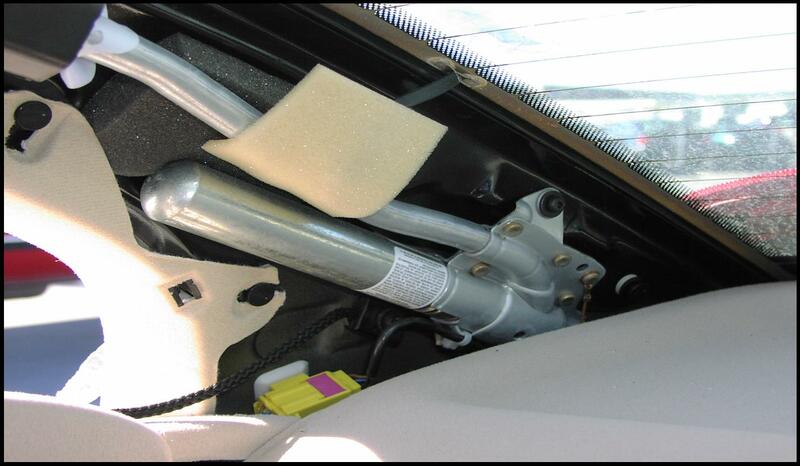 Unlike most airbags the tube does not deflate, there are no vent holes to allow the nitrogen to escape. The tube remains firmly inflated to offer head protection from rebound forces which are common in side-impacts and rollovers. The tube will actually remain inflated for hours after the collision. Once the door is opened rescuers can safely puncture the tube and cut the mounting strap at the B post to get the bag out of their way. Like all side impact airbags these can not deploy a second time. Caution! If the tube is not deployed rescuers must not only stay out of the deployment zone of the tube, but the whole door area. These tubes are always used in conjunction with a torso type door or seat mounted airbag. 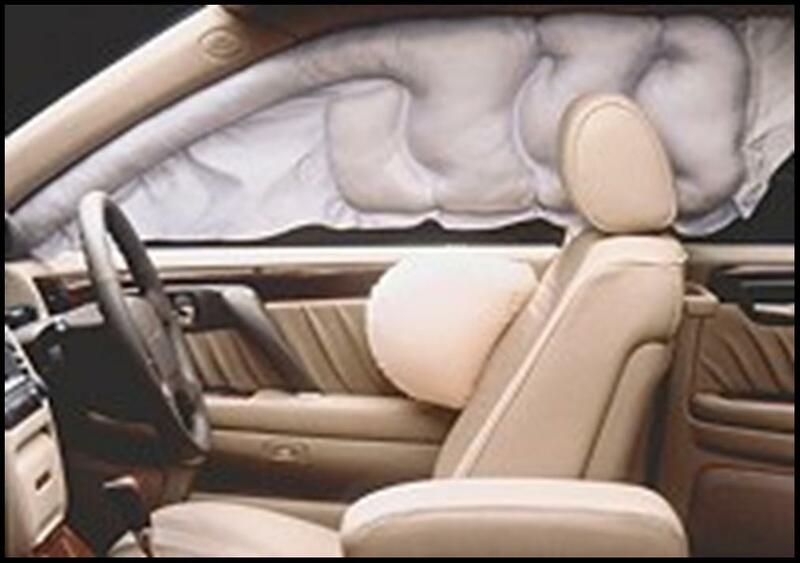 The two most commonly used curtain airbags are the front window type and the full length type. The front window curtain usually extends from the A post to the B post and extends down from the roof to about the top of the door panel. The full length curtain usually extends from just behind the A post to the C or D posts and extends from the roof to the top of the door panel also. 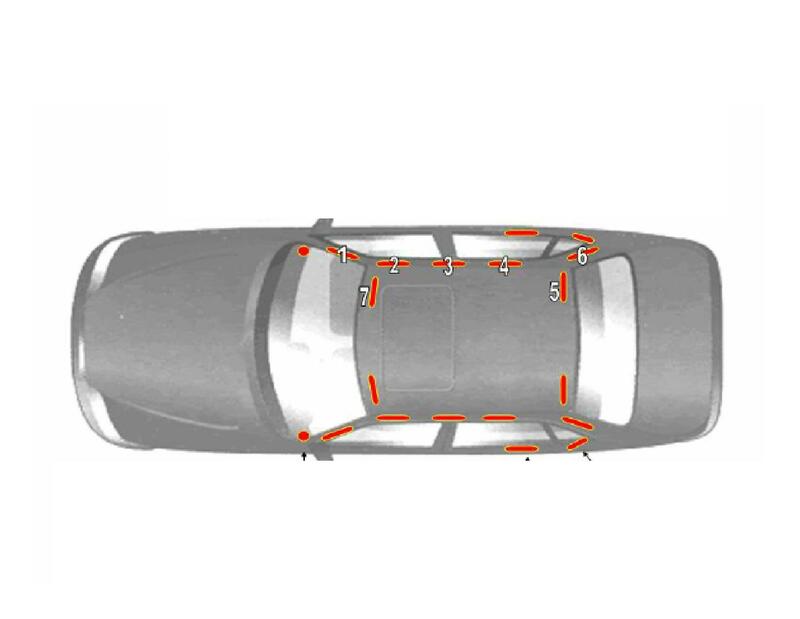 Like the head protection tube, both of these are hidden behind the trim panels and head liner, when undeployed they can only be detected by small emblems embedded into the trim panels (Examples: SRS, Airbag, HPS). Warning:Rescuers must be aware that these emblems do not indicate the exact location of the airbag they only indicate that one is present. These bags are deployed by small stored gas inflators that can be located at the front, center, rear, or anywhere along the system. They are found in the A post, along the roof rails, in the C or D posts and some even over the rear glass. Warning!It is extremely important that these inflators be visually located before any extrication procedures begin. Unlike the stored gas canister built into the passenger’s frontal airbag, these inflators have no protection around them; they are simply a long thin tube that is felled with compressed Argon gas. If accidentally cut they would act much like two large bullets flying in opposite direction through the vehicle. Rescues must peel the interior trim and visually locate these inflators. Even though the electrical system is shut down stopping the deployment of the airbag, these inflators will become projectiles if cut. See Videos Below! Like all side impact airbags these deploy much faster than frontal airbags and they deflate much slower, allowing more protection for rebound impact and roll over. Warning! With these becoming standard equipment on most vehicles, rescuers must learn; when approaching the vehicle never lean through the window, these airbags deploy straight down approximately 18 inches, or from the roof to the bottom of the window and are capable of snapping a persons neck. See Videos Below! Once the door is open, if the curtain is deployed, rescues can safely cut the bag and get it out of their way. 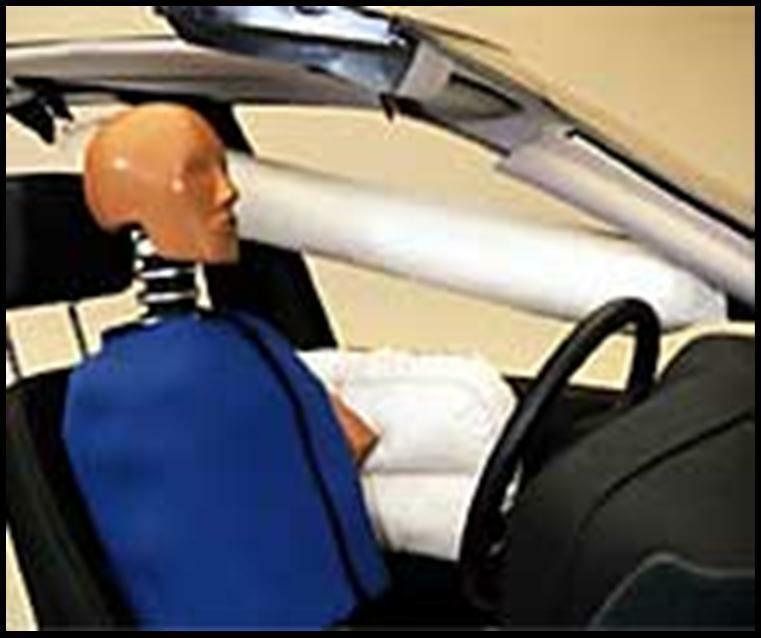 Unlike frontal airbags there are no dual stage side impact airbags made. If the curtain airbag is not deployed; the rescuer must stay out of the 18 inch inflation zone until the time the electrical system is shut down and the capacitor drain time has expired. Many questions have been asked about cutting the bag itself. Though it is a very bad habit to get into, the nylon bag itself can be cut on a loaded curtain airbag, (after the system is shut down), as long as the inflator is not touched. Nothing will happen by cutting the nylon. If an accidental deployment were to accrue the gas would simply blow out the end of the inflator. Unlike the pyrotechnic inflators the gas would not be hot; it would simply be a sudden blast of air. Another question is: Can we cut a deployed curtain airbag inflator? This is another very bad habit to get into, but, yes it can be cut. No side impact airbags have a dual stage, once the bag has deployed the inflator is simply an empty canister or piece of tubing. Rescuers must always remember! You have other members of your team that may not be as informed of these systems as you are and what they see you do, they will do in the future. Be very careful about performing these bad habits. 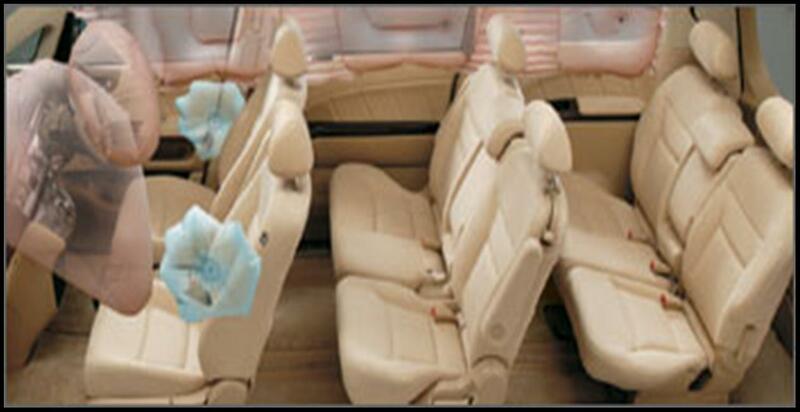 Many manufacturers are now equipping their SUVs and vans with curtain airbags to protect the third row occupants. These airbags operate the same as the front window or full length type. Warning!The main concern with these is that rescuers must remember that there will be two inflators on each side that must be visually located before extrication procedures begin. In the last few years many manufacturers have also redesigned these airbags to operate as rollover protection. These operate much different and will be explained in the rollover protection section.